At the end of the day, Laura said it was Friday the 13th and a few of us had to think twice about it. It was Friday and bad luck seemed to ensue from the moment we woke up. WHAT A DAY! We start off waking up late. We were supposed to pick the solar car up from Sidwell Friends school at 8 am because they were kind enough to house the car in their garage, then there was an appointment at 10 am to have the solar car's electric motor checked out. So all 8 of us get up, get ready and are out of the house around 9 am. Yeah, pretty late. With Jim, Laurie, and Mark following us in the Barbie blue mustang we take off on I-95 into D.C. until we get a call from Jim - "You need to pull over Marcelo, the trailor is smoking." So we pull over and it turns out that the back wheel bearing on the trailor was broken. Marcelo removes the wheel (while Jim is nicely but sternly telling myself and Valerio to stay away from the interstate lane- what a great guy!) and we are ready to take off with a 3 wheeled trailor. But wait! There's an enormous tick on the door of the van! Not only that, but there are two other ticks on me! What could possibly happen next? Well as we get ready to take off, the support van won't start! In the mean time, Josh is calling the electric motor company to let them know that we have to reschedule. He also calls AAA so that they can send someone out to jump the van battery. Valerio, Jim, Mark, and Laurie leave in the mustang while we wait so they can go ahead of us and start charging the car. We continue on to the school. Bad things come in 3's right? What else could go wrong? Well at this point I think the count was at five - 1)wake up late 2) wheel bearing goes out 3) tick infestation 4) battery dies 5)Jim's fingertip is masacred. Only good things can happen at this point right? Wrong. About 1 mile before we get to the school we accidentally hit a car from behind. And who comes out? It turns out that 4 priests were in the car. They were nice, pictures were taken, info was exchanged and we were off again. I guess if we hit anyone, it might as well be the most forgiving right? So we finally get to the school and get some food in the cafe. I briefly took a bathroom break and as I return to the cafe Josh comes out saying "That was so surreal!". "What was so surreal?" I asked. It turns out that Obama's daughter Malia walked in to the cafe just as Obama was giving a press conference on the t.v. in the cafe. She walked in and it didn't even phase her that her dad was on television. Crazy. So with the type of day we had we figured we should leave early for our next appointment at 2pm with the American Council on Renewable Energy (ACORE). They had Marcelo give a demonstration at the Christian Science Reading room which was a few blocks from the White House. Several people showed up including Ken from the Canadian Embassy, Charles Garlow from the Electric Vehicle Association and an Attorney for the EPA, the president (I think) of Solar Energy Light Fund (SELF) and Michael Eckhart who is the president of ACORE. Michael was great and gave us a set of renewable energy posters. It also turned out that he played a role in the implementation of feed-in tariffs in Germany so Josh got a great interview with him. Jim and Mark also gave a good presentation on their new on-line t.v. show called "Energy Rush" in front of the entire ACORE office and everyone seemed pretty receptive of their program. It started to rain before the end of the demonstration so we waited the rain out so that Marcelo could drive xof1. We grabbed dinner with Margerite who worked with ACORE and set the demonstration up for us. We ended the evening with a few drinks to celebrate Valerio's departure because he was leaving the tour the next day. We will miss you Operetto! Mark gets up about 5:30 AM, Jim & I hear his alarm go off, so we get up, too. The three of us are all thinking that we need to be back at Sidwell Friends by 8 AM, so we better get cracking! Jamie had moved down to the den couch and was also awake. Our wonderful host, Don has made us all boiled eggs, toast, fruit and cold cereal, so the four of us eat breakfast. Marcelo and the rest of the crew struggle to wake up; they are still so tired from their long drive the night before. They are all sleep deprived. They don’t rouse themselves until after 7 AM; a few of them don’t get the chance to have breakfast. We realized that we definitely are not going to make it back to Sidwell Friends by 8 AM. We leave the Patterson house about 8 AM; we hope this will help some with the bad DC traffic. I opt to ride in the convertible with Mark and Jim this time, it was so much fun! Marcelo drives the van and Jamie, Josh, Laura and Valerio ride in the van with him. About half-way to the school, Mark smells something burning and we see a problem with the trailer; we phone Marcelo and ask him to pull over and he does immediately on a very busy highway, cars whizzing by! Marcelo gets out and checks the wheels of the trailer and determines that the trailer has lost some bearings in one of the wheels. He decides we can drive safely with one wheel taken off, so he gets busy removing it. With this task accomplished, Marcelo gets back into the van, it refuses to start! Battery dead, bummer! Luckily, Josh is a member of Triple A, so he gets on the phone and calls them for help, Yay! Help is on its’ way, but it may take a while and we still have the solar car waiting at Sidwell Friends for us to pick up. We get to the school about 9:30 AM and find the garage door open and Steve and several men waiting beside it. I make some very hasty apologies and we get busy with moving the solar car. We decide to push it to where the van was parked yesterday, not too far away. We are in a big hurry, though because we are late. Right as we have it completely blocking the driveway and about half-way to the spot we have picked to push it to, a Washington, DC policeman pulls in right behind the solar car, oh no! He doesn’t have his lights flashing, but we are concerned and a little flustered now so we push the car even faster. This causes Jim to get his right index finger caught between the spokes and brakes of the solar car wheel, sheering off the top � inch of his right index finger, ouch! Jim immediately stops pushing the car, yells something like “I need help, something is very wrong!” and runs off toward the garage area. There is only Mark and I pushing the car now, so I call for Valerio to come and help me and as soon as he arrives to take over my spot, I run into the garage to see what happened to Jim. He is already telling Steve and the men in the garage area that he needs to be taken to the ER immediately; he refuses the ambulance at first and wants me to take him in the convertible. He is holding his hand in a stream of cold water in the utility sink, I find out what has happened and ask for ice for him. Someone says he will get it ASAP. Steve asks if he can call an ambulance, we can’t decide yet if we need one, Jim is fighting going into shock. Mark and Valerio have finished pushing the solar car and when Mark sees what happened to his finger, he asks for an ambulance to be called right away and I agree; I am in no shape to drive Jim through an unfamiliar town with his hand bleeding profusely! The men get Jim a chair; I ask them for a drink of water for him, they get that and finally some ice. It occurs to me that I might find the fingertip, so I run back outside to look for it, and find it. I ask for ice for it and the wonderful men in the garage bring me some. The ambulance has been called and we are waiting for it. It is probably 10 or 15 minutes before the ambulance comes, but it feels like an hour. Jim says he is not in a lot of pain and begins cracking missing limb jokes left and right; that is when I know he will probably be okay! They give Jim some compliments for his low BP and heart rate (that’s from running!) The ambulance attendants try to decide which hospital would be best for the injury, they try to talk Jim into going to Baltimore, MD. We know that is pretty far away, even further than Laurel, MD, so Jim asks for a closer one and they suggest one nearby in the DC area. Jim wants to be able to try to make the 2 PM presentation of Marcelo’s at the American Council on Renewable Energy (ACORE) since he helped to arrange it; he is worried he won’t make it there in time if he goes all the way to Baltimore. Before Jim gets into the ambulance, he frets whether Valerio and Mark have flipped the right switch on the solar car to charge it up, we almost have to restrain him from going to check it himself to make sure, but we are able to talk him out of it! He is loaded up in the ambulance and I give the keys to the convertible to Mark and my cell phone to Valerio, since we still have Jim’s. Off we go in an ambulance; Jim is feeling a little better now. During this crisis, I really appreciate both Mark and Valerio, I am glad they both were there! Steve Sawyer and all the men in the garage area were terrific, too, thanks guys! Marcelo has been informed of the news of Jim’s accident; he is already on his way to the school and is very concerned. He is talked out of joining us at the hospital, but must be a little unnerved, he has a fender bender with the car ahead of him; it is occupied by 4 priests! What else can go wrong today? Marcelo and crew join Mark and Valerio at the school, they stay there a couple of hours to charge the solar car’s batteries. Some of the crew hasn’t had breakfast, so they take advantage of the down time to hit the school’s coffee shop. While there, they have another Malia sighting, she comes in for a bagel with her Secret Service agent very close by. Mark tells me later that he wishes he could have gotten a picture. While she is in the shop getting food, her father comes on the coffee shop’s TV and she remains totally oblivious to him, she must be really used to him being on TV! It would have made a great picture, Mark believes. Too bad he couldn’t take it! Marcelo’s very good friend, Rob, arrives about 10:30 AM from Toronto, he has brought some replacement solar cells for the XOF1, and some identifying stickers for the solar car, very nice! When the batteries are charged a little, it is decided that everyone should pack up and try to get to the next destination. Good thing they start out early, the van battery refuses to work again, Rob decided the cables need adjusting and Mark jumps the van with the Mustang, hopefully the battery will not fail next time! Another curious student has come over to see the car, with a parent in tow. Intrepid Josh interviews him and they ask the child’s mother for directions to ACORE. She tries to give them the directions, but ultimately decides it is just easier to lead the vehicles with her own car. They all arrive at ACORE at 1:15 PM, well ahead of time! Marcelo tells the mom, “Now you are a member of the solar car team!” I bet she liked that; it is a lot of fun to be a member of the team, if only for a little while! The ACORE presentation was arranged by Marguerite Jones of ACORE, so she jumps in with the Sidwell parent when she arrives to show her where to lead Marcelo in the solar car. Mission accomplished! At this presentation, there are a lot of important people to see Marcelo. Mike Eckhart, the president of ACORE greets Marcelo, and he also meets Ken England, the Canadian Energy Commissioner, Bob Freiling, of the Solar Electric Light Fund (SELF), and Charles Gorman, EPA chairman of the Air Enforcement Division, and an electric vehicle enthusiast. There is a reporter, too, and Mark from EnergyRush.TV. Jim and I are at the ER for several hours and he gets released about 1:15 PM; we decide to try to have lunch before going to the ACORE meeting. He gets to eat his lunch, I spend the whole time trying to get his prescriptions refilled, I finally give up and we take a taxi to ACORE, arriving around 2:30 PM. Jim immediately makes a formal introduction of Marcelo with Mike Eckhart, Josh and Mark videotape it. Next, Marcelo talks to the many people and the reporter that is there to see him, Jim is invited up to see the ACORE headquarters. Mark goes with him, and so does Josh. Jim makes a pitch to ACORE to sponsor Marcelo; they agree to do this and to put Marcelo’s website up on their own website, which gets a lot of hits every month. We hope they follow through on both of these promises! Unfortunately, Rob has to go back to Toronto at about 3:15 PM, before I come back down, I am so sad I missed seeing him except for a quick hug; he is a fine man and one of Marcelo’s best supporters. About 4:30 PM, we go back outside, where is the solar car crew? We try to gather them up, Marcelo wants to go now, customers are scarce and the weather looks ominous; it is about to rain and storm! We fret a bit about it, but there is nothing that can be done; “Let the stormy clouds chase, everyone from the place, come on with the rain, I’ve a smile on my face!” It thunders and lightning strikes (but not us, we are under an eve), we watch the solar car get a good soaking, some of the crew get soaked, too, Valerio has a great attitude about his nice suit getting wet, and so does Laura! Some get in the van, the rest of us just wait it out. The storm lasts a good 30 to 40 minutes; I had bought some garbage bags at the drugstore when I got Jim’s medicine, so we used them for some of the camera and other equipment, to keep them dry. We begin to put stuff in the van so we can leave as soon as the rain abates some. We debate what to do, Jim wants Marcelo to drive the solar car in front of the White House so Mark can take videos; Mark doesn’t want to do that with the fancy camera because it doesn’t belong to him. It is decided that Josh will take videos with Marcelo’s camera, from the back of the Mustang convertible. Jim will drive, Marguerite will give Jim directions, and I will take pictures with my camera, too bad I didn’t use Marcelo’s camera, the pictures would have been better! We drive around the White House area for quite awhile, snapping videos and still shots. Josh enjoys being the paparazzi a lot; it does give me an adrenaline rush, too. We finally exhaust the batteries of the video camera, and some of us are starving. I haven’t eaten much of anything since 6:30 AM and it is now 7:30 PM, we stop and argue a bit about what to do next. 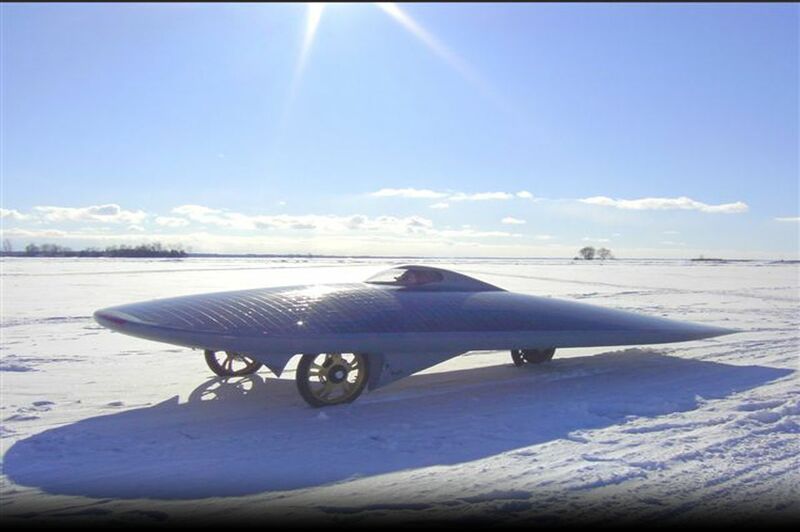 Some want to put the solar car in the trailer, some want to eat, some want to drive around for more photo ops; we have trouble deciding what to do. A parking police comes and tells us we must move, so we drive around a bit looking for a good place to stop with the van and trailer, it is so large. We find what we think is a good place to load the solar car up and stop there. Marguerite tells me a great pizza place is nearby and so I go order pizza for everyone while they decide what they want to do. It is about 9 PM before we eat dinner. The crew loads up the solar car while the pizza is cooking. I have tried to order 3 out of 4 pizzas vegetarian for the solar car crew, only one of them ends up coming to us completely vegetarian, if I wasn’t so tired and hungry, I would have argued with the owner over that mix up! Everyone is a good sport about it, especially Laura. We are all tired and get back to the Patterson’s house about 11 PM. Jim doesn’t appear to be in too much pain and we are hopeful something good will come out of the contacts made today. We sleep dorm style again, I am a little sad because Valerio will be leaving the tour tomorrow and Marcelo will pack up the solar car and trailer it back to North Carolina, along with Jamie, Josh and Laura. Good night solar car crew! What a crazy morning! I couldn’t find my battery charger, I practically coughed up a lung, Jamie was attacked by ticks, the trailer wheel had to be removed due to brake trouble, the van’s battery died, Jim lost his fingertip to solar car spokes, becoming our environmental martyr, we crashed into a car full of four catholic priests, rob was stranded at the airport with solar cells for Marcelo, and we hadn’t even set up the array to charge the car for its trip through D.C. When we arrived, at the school, we had to quickly set up the array. We got some coffee on campus, and I charged my phone. While we were waiting, we watched Barack Obama speak about IT and national security on the news. Malia Obama walked in for some quick coffee too. We then talked to Mr. Reed, a student at the Sidwell Friends School. He was very active with environmental issues at only 16 years old. He has been working with the Sierra Student Coalition, the Powershift conference, and has been a solar advocate since he was quite young. He was conversant in current energy lingo, and was quite knowledgeable about solar energy in particular. Marcelo gave him a solar cell to use on one of his inevitable experiments with solar energy. We left the Sidwell Friends School after charging the array a bit, and things started to brighten up after a gray, gloomy, and chaotic morning. We took the XOF1 from the Sidwell Friends School to drive to the Christian Science Reading Room. We had a reception ready when we arrived. Although the D.C. streets were packed and quite busy, we managed to evade any serious problems. The American Council on Renewable Energy was quite excited to meet us for a photo op. We first met Marguerite, who was very nice, and welcoming. The Canadian Energy Dept. representative also showed up. Charles Garlow, a member of the Electric Vehicle Association and attorney for the Environmental Protection Agency. He was quite excited to see the car, and was telling us about the solar taxi project he had worked on. He hooked us up with Chip, a mechanic who said he might work on the trailer. Charles also said we could call him if we needed a place to stay. I interviewed the owner of the building, talked to him about green renovations. Michael Eckhardt, the president of ACORE, came to see the XOF1 for himself. He got some great pictures by the car, and then invited Jim, Laurie, Mark, and me up to the ACORE office. I went up and commented on his renewable energy posters. Since I took such a liking to them, he donated a set to the solar car team. He had a poster for geothermal, wind, solar, and more. I went to Michael’s office with the whole Energyrush.tv team. We talked about the XOF1, and also the different mediums for spreading the word about renewable energy. Michael decided to gather the whole ACORE office together for Jim’s presentation. I filmed briefly, but stopped after some brief introductions. The video first showcased the XOF1, but later showed some other Energyrush.tv footage. I then took a video of Michael speaking about Feed-in-Tariffs, which he helped to institute in Germany. The crew started to pack up, and we went downstairs to meet the rest of the XOF1 team. Just as we were about to leave, it started pouring. We slowly loaded up the car with our equipment through the storm, and then things began to lighten up. I secured the video camera with a garbage bag and a hair tie to keep it dry, and hopped in the back of Jim’s blue mustang convertible to grab some footage of the XOF1 driving through the streets of downtown. Jim’s car roared past the white house, while he led the team through the city in spite of his morning injury. We took pictures until both video cameras ran out of battery, and even then we were able to borrow Laurie’s camera to take some more interesting shots. The team quickly loaded the XOF1 into the trailer, and we headed out for some nice Italian food. At Pete’s A’pizza, one of D.C.’s finest pizza places, Valerio finally approved of some high quality pizza. We would have loved to go out, but, we had to drive back to Laurel, Maryland to spend one more night with Don. thats me. It’s dark when we leave the crowded downtown pizza joint and cold too! It’s a nice change from the heat and humidity of the city during the day. Valerio offers me his jacket and I’m cozy warm in Italian formal wear, now who’s operetta?! A stop at whisky bottom liquor store to pick up a bottle of liquid relaxation after a strenuous day results in a late night toast and a happy ending to what began a tragic day. Cheers! Marcelo removing the bearing from the back wheel of the trailer. Physics professor from Sidwell Friends on his way to school. He had a great shirt - "One less car." Rob adding the new decals to xof1. He traveled all the way from Toronto to help out in DC and only stayed for a few hours. Marcelo gaving a few solar cells to a school teacher at Sidwell Friends. Jumping the van battery, again. Jim, Laurie, Mark, and Josh filming the car from the front. Displaying xof1 at the Christian Science Center for the American Council on Renewable Energy. Margerite and Rob describing the car to school children passing by. Valerio, our secret agent man. Marcelo and Rob speaking to a Canadian Ambassador and the gentleman from SELF. Jim (minus a finger tip) opening xof1. The Toronto team - Rob and Marcelo. What great guys!! Marcelo is being interviewed by Associated Press. Dinner with the 7 person crew. Our largest yet.